Outback Jack's at Nambour has a great relaxed vibe. Situated on the main road of Nambour, it's easy to get to from the train station and open nights when much of Nambour has gone to sleep. Outback Jack's is the place to go with a group of friends or if you are a family with children. We went there as two couples with one primary school age child and a baby. The wait staff seated us at a large table situated in an alcove so the children could amuse each other, and weren't a bother to other guests. The tables in here are large timber style. The whole restaurant has a rustic theme with a friendly mood. It could possibly be romantic, depending where you sat, but is not fine dining. The menu is Australian serving steaks, chicken and seafood with salad, vegetables and chips. As you would expect from an Australian restaurant the steaks on the menu are the speciality and they serve all manner of sizes and variety of meat. Steak toppers are available and definitely add to the meal. Outback Jack's have a 1kg steak meal called Jack's Challenge, consisting of 1kg steak with 500 grams of vegetables and 500 grams of fries or wedges. If you can eat it in 30 minutes the meal is half price and you get a shirt declaring the feat to all. On the night we were there, one of our party was having a birthday. We had brought a cake with us and our waitress took it out the back, prepared it and lit our candles, and then brought it out accompanied by the entire wait staff singing Outback Jack's own version of Happy Birthday. Our waitress also brought out colouring pencils and drawing paper for the child in our group, which kept her happy for the evening. The menu for Outback Jack's is full of variety and this restaurant is highly recommend as a place to bring kids. I would not pigeon hole it as a kids' restaurant though. The rustic environment, timber tables and other furnishings make it a great place to meet up with friends and have a few drinks. The Nambour restaurant is large enough for different groups to be able to enjoy their night without disturbing each other. 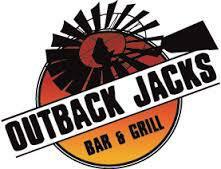 Outback Jack's Nambour is located in the old Club Hotel, 84 Currie Street, Nambour. They also have a cafe open from 8am where they serve coffee and cakes.